We don't have anything similar in build pages on the main site. I'll add your project there as well. You have a long list of features, will be interesting to follow! I'm really excited about adding @petewill 's Bed-Occupancy-Sensor... I've got two kids (and I'm planning on building them both a clock)... and they are at my house 50% of the time... so I want the alarms to go off on school days, but only when they are at my house. So I plan on using the bed occupancy sensor to cancel the alarm if no one is in the bed. On the flip side, if the kid turns off the alarm, but doesn't get out of bed within a set amount of time, I want the alarm to go off again... kinda like a forced snooze. Haha, evil father The kids will probably outsmart you somehow. Don't we all have a list that is too long. Eventually I'm going to make a case/enclosure for it. I've finally settled on an enclosure design for my first (of 3) clock. This one is for my 10 year old son, I think he's going to love it. 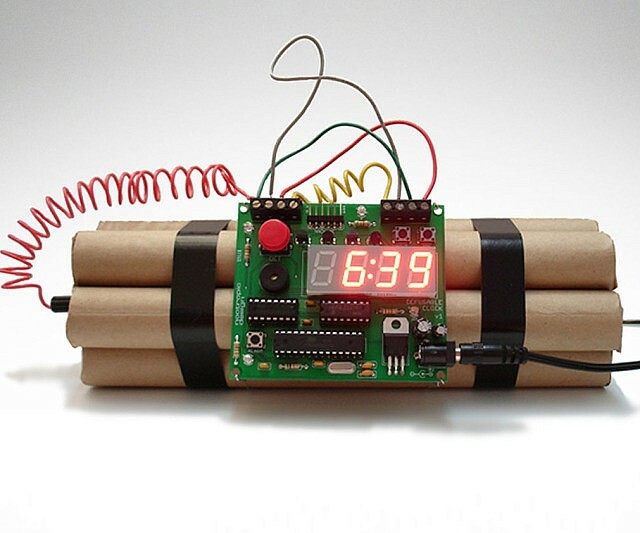 I'm going to use the bomb idea but modify it to fit all my existing design elements. How do you transfer this to the arduino? Hi Can someone point me in the direction of the Ardunio code for this project? I have everything built and can get any code to work with the liquid crystal lib? @Newzwaver are the files in the sources tab insufficient? If so, could you clarify what is missing? thanks for the reply and I might be missing it but the Arduino file is not posted under the code tab. @Newzwaver could you be a bit more specific? Which file is missing? There should be some file ending in .ino? So that's what is missing? Yes the file ending in .ino is missing as you can see by your post above. Thanks. Hopefully micahbowerbank kan reply. SO does anyone have any code for this project? I need the arduino code. Thanks in advance, excellent project btw. Sorry, had a computer crash and file loss issue a few months ago. I can't find my final code file, but I did find an older version (incomplete) called ClockRebuild.ino and I uploaded it to the project. Thanks for the arduino code, i will give it a shot. In this approach, whichever button you press, the resistor values, being in series, add up giving you a different voltage on your analog pin. With your approach, you use different resistor values on each switch which gives you your different voltage. My approach is only slightly different than yours. I am just wondering if there is an advantage one way or another. I guess it is useful in the case when user pushes more than one button ? I hadn't thought about that, but you are right. In my example, you couldn't press more than one button. I originally went with the same resistor value so that it was easy. But then when I thought about how many button combinations I wanted (thinking about a real clock where you hold down the alarm set button then press the hour button) I went with different values. My implementation still isn't perfect, since I'm a bloody amateur... lol. I think 1 or 2 of the combinations I never got working. I made some modifications (although I can't quite remember what they were), I think about the number of buttons, or combinations, or target values. @micah Picking resistor values based on the number of switches you have shouldn't be too terribly difficult. You ar just creating a voltage divider circuit. When pushing multiple buttons, you just have to look at the resistor values for the buttons you have and calculate out the parallel resistance. Then you just have to figure out the analog value for any key combinations you want to use and create IF or Switch/Case statements to perform your logic. So, I didn't look the sketch over for this, but I am planning on building one of these and I have some questions. Does this show in 12 hour or 24 hour format? If it is 12 hour, how do you indicate AM or PM? Also, do you have a way of indicating that alarms are set? I may add some LEDs for these features. Here is my start on this. No speaker yet and I haven't added the LEDs for AM/PM and alarms, but that will come. I will need to make a bunch of modifications to the sketch. Mainly because I am using a different RTC module (DS1307). It is one that I have had laying around in my parts bin for years. I get a bunch of compile errors when I try to include the RTC library for this module. Here is the board layout so far. I wasn't necessarily saying that I wanted to switch to 24hr format. I was wondering if you had a way of indicating AM and PM when in 12 hour format. I see, so when it is blinking there is an alarm and when it is on solid there is not. I may add a different alarm indicator..
One other question on this. I see you have 5 buttons on your switch panel. What were your planned uses of those 5 buttons? I didn't see anything documented on that. The method Check_KeyPad (Line 300) handles the buttons. Another thing that I've thought of is removing the RTC module completely since we can query the time from the server periodically.